Badalon mein bhi praan hain (clouds, too, have life)," Chandrika Mahato says, almost whispering, and the statement hangs in the damp pre-monsoon air. We are sitting in front of his house—made of mud and held together by concrete in some parts—in a north Bihar village called Telua in West Champaran district that is sheltered by the five-decade-old Champaran embankment, now almost as fragile as Mahato’s house. A giant mango tree in his courtyard has encroached slowly on to the embankment—blurring the boundaries of public and private land. Under its shadow, Mahato, an embankment chowkidar (guard) who hasn’t been paid for over a year, discusses his ability to navigate the monsoon sky like a map, looking for signs of rain. Clouds are celestial tricksters. Mahato never takes their appearance for granted. “It matters which part of the sky they emerge from," he says, pointing to the north-west. “Bhandarkon—if you see clouds arising out of that corner, we are surely going to get good rains." The word is pregnant with expectation. Bhandarkon translates poorly into English as a corner warehouse—but for Mahato and others living on the floodplains of Bihar, it is an auspicious nook in the sky where clouds are unboxed and sent out to the human world. Monsoon rains in the floodplains of north Bihar are quite unlike the indolent, nostalgia-evoking phenomenon in an Indian metropolis. Here, they decide between life and death, a good harvest and being stranded on a boat for weeks with little to eat or drink. The late writer on water conservation, Anupam Mishra, described this region as a playground for Himalayan rivers. As they descend into the plains, they dance, eddy and gambol, animating a landscape thirsty for water. The mineral-rich soil from Nepal, washed down by the monsoon rain, makes the north Bihar floodplains one of the most productive regions in India—an area which gives two good crops each year and where farmers, just a decade ago, considered fertilizers superfluous. In this landscape crafted by thousands of years of monsoon rainfall, even land is fluid. It submerges, shifts, cuts away from the banks, loses shape and reacquires it elsewhere. The expansive floodplain is called diara. Braided by rivers, depressed in the middle, raised at the edges by natural levees—to some, the shape is reminiscent of a diya, an earthen lamp. Other locals concoct a bleaker origin—as the floodwaters erase habitations from history, diaras become a dark zone, a place where evenings are bereft of light from diyas. Historians etymologically connect it to the Persian term “Daria-bar-aamad"—daria being river, bar aamad, recovered land: Diara became land retrieved from a river. Ram Bhagat, a farmer, was brought up on the shifting alluvial sands of the diara next to the Gandak river. We are sitting on a charpoy—the old bamboo frame held together by jute ropes—facing the mud-plastered walls of his house being gently baked by an afternoon sun. Each house on the diara is a living flood museum, a disorganized assemblage of artefacts and mementos that survived a deluge—fragments of thatch embedded in the wall, a door, an old bed with its legs buttressed with tin plates, thick bamboo poles that still hold up a roof that is part rusty tin, part thatch. Bhagat points to items that he salvaged from the last flood—each embedded with memories of people and places. Like Mahato, he never takes clouds for granted. “Too high a risk," he says. Then he gets up from the charpoy, grabs a dry twig, and proceeds to etch the sky on the loose and dusty silt of the diara in the form of a square. Using his thumb, he makes a little circle in the southern corner. “The clouds from the southern corner of the sky almost never bring rain," he says with confidence. “But if they do, expect a deluge." “Has that ever happened in your lifetime?" “No, but my babuji (father) told me. He lost his brother to a flood that came with clouds from the south." Rain revives memories of loss. Death and floods become markers of time in family genealogy. Children who went for a swim in a swelling river, sleeping infants who rolled down from a thatched rooftop into the floodwaters below—many of them were never seen again. Some of those who were lost later became dubba—river spirits that drown people. Born out of death and nurtured in the shadow of rain clouds, dubbas are the children of the monsoon. Jan Mohammed is a dudhela—an expert in milking cows. It was a chance encounter. He had come to the village to milk cows at the same house where I am asking locals if they can predict the onset of rains. Jan Mohammed floats into that conversation. He has the quiet confidence of a man who knows what he’s talking about, and if there is one thing he knows, it is how to read the intent of clouds by looking at their “rang aur ruab"—colour and shape. “Dark clouds only carry promise, but not enough rain," he says. While dark clouds crack up and dissipate, light-coloured ones bring heavy rain. In the floodplains, clouds are judged by their colour. Clouds are but one indicator. Farmers use crop almanacs to navigate the night sky, looking for hope in constellations and planetary alignments. Rain that falls under the haathiya constellation—called so because it looks like an elephant’s trunk—is believed to sprinkle stardust on alluvium, leading to a bountiful harvest. In the tola of Bariarpur—which translates as the village of a strongman—Mohan Singh is sitting in a red plastic chair, wearing a vest and a white dhoti—a rudraksha mala adorning his neck. When he speaks, the otherwise raucous group tends to go silent. “We have learnt from our forefathers how to read the constellations to predict rainfall. It has never failed us. My father used to tell me when I was a child, ‘Jab purwa purbaiyya pabe /tab sukhli gadaiya nao chalabe (When the west wind—purbaiyya—starts blowing under the Purwa constellation, there will be so much rain one can sail a boat—nao—in the low-lying dry river channels—sukhli gadaiya)’." The monsoon blurs obdurate lines between science, folklore, superstitions and myth—leaving one to wonder which is which. People believed that their actions influenced divinity. If rainfall was incessant for successive weeks, a desperate farmer—with only one male child as an heir—would strip naked and walk from his home to farm in the early morning hours. He then tied a piece of cloth to a wooden leveller and had to return home unseen. The cloth hanging from the leveller was a signal to Indra, the Hindu god of thunder, to take the rain clouds away. To trigger rain, younger villagers would subject the most abusive man in the village to frequent guerrilla attacks—cow dung being a weapon of choice. If they got him angry enough to spew the vilest of abuse, it would force the sky to open up—an odd barter which may have produced more mirth than rain. A narrative of desperation underlies such farce. As a villager wistfully tells me: “Nothing has changed. Earlier we used to beg from the gods, now we beg from the government." The approach to the Dalit tola of Navrahi is narrow, and all the houses are built inwards towards a large common courtyard—their walls acting as fortification from the outside world. The courtyard is clustered with geheri—large cylindrical structures made of sun-baked mud and straw which store harvested grains for a year: Their oscillating levels decide well-being. Punita stands outside her tola, draped in a green sari—an old blue Nokia handset peeking out of her hand. She has rushed over after hearing that visitors have arrived. Owning little or no land, men plan their departure to urban centres before the arrival of the monsoon—looking for work as wage labour. Their absence leaves the settlements to women—a sisterhood that battles patriarchy and floods for six months in a year. For women in Navrahi, monsoon is the season of separation. We sit together on the floor of a cemented house, freshly constructed with remittance from abroad. The air is charged with caution and curiosity. But after a few cups of overly sweet tea, we relax into easy conversation. While men occupy themselves with the skies, women look to the land. The monsoon heralds its arrival through the intensified singing of jhingur (crickets), sparrows taking frequent dust baths, the sudden appearance of swarms of dragonflies, and the endless croaking of peela mendak (yellow-bellied frog). Rani says, “Just before heavy rains, fatingas (winged ants) gather and fly around in huge groups, as if they are forming clouds of their own. When I see that, I leave everything behind and rush home." As I take my leave, a newly-wed—forehead splashed with vermilion—starts speaking softly. There is an odd familiarity to her voice—it strikes me that she is speaking in Bengali. She has identified the inquisitor in their midst as a compatriot through his accented Hindi. She used to live on the outskirts of Uluberia, a small town in Howrah in West Bengal—a railway station that blipped past every time I took the train to my grandparents’, who lived another 20 stations down the railway tracks. 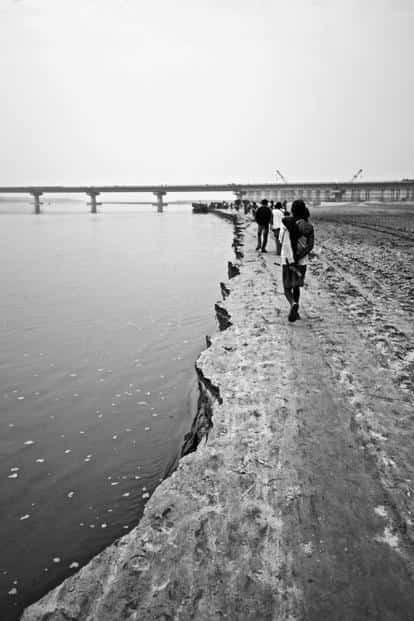 She fell in love with a Bihari worker and left home to settle on the silted banks of the Gandak. What is it like to stay there? She doesn’t like the food, but her in-laws are nice. She is the only literate woman in the family, having completed her schooling. She writes letters, sends text messages for other women to their husbands, receives money orders. She likes being useful. She does miss the rain back home though. It was gentler, softer—the sort of rain you would like to go out in. She misses that. Here, the monsoon frequently carries floods in its wake—a kind she had never seen before. After the first flood—where she spent a week on the roof—she has grown wary of the rain clouds. “Does it rain like Kolkata in Delhi?" she asks me. It was then that it dawned on me how monsoon has its own language—it speaks differently to different people in different places. Like everything else in India, the monsoon is also vernacular. And after a long time, I missed the monsoon rains of my hometown.